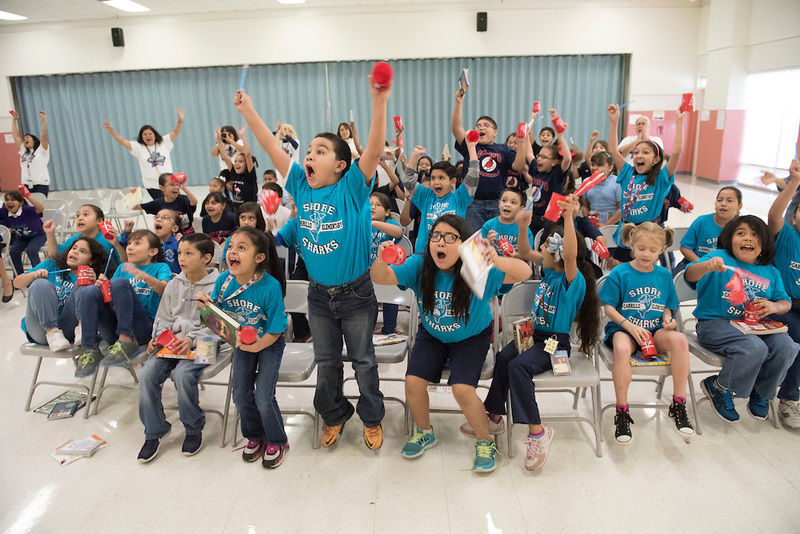 The competition was fierce down to the final buzzer, but Dogan ES came out victorious after scoring a whopping 922,464 minutes in reading time during the NCAA Read to the Final Four Literacy competition. Dogan ES Principal Tarrieck Rideaux beamed with pride Friday amid cheering, hand-waving, and fanfare at NRG Stadium, where 10,000 HISD students, some representing the Final Four schools – Browning ES, Carrillo ES, Dogan ES and Janowski ES, gathered for the announcement of the winner. Rideaux said six months of intensive reading had paid off for his third-graders. The top four schools read a total of 2,695,728 minutes since the competition began in September, and all schools netted 9,128,176 minutes read. Dogan ES was awarded a Final Four trophy and a $5,000 cash prize. On Monday, there will be a celebration at the campus. Courtside VIPS on hand to celebrate the students’ accomplishments included HISD Board of Education Trustees Wanda Adams, Diana Dávila, and Anna Eastman, as well as HISD Chief Academic Officer Andrew Houlihan and Houston Final Four Local Organizing Committee Chairman Tony Chase. Early in the program, Team HISD enjoyed performances by the Waltrip HS band and the Atherton ES drum line, as well as a quick game between the Cancer Hardwood Heroes and their coaches. 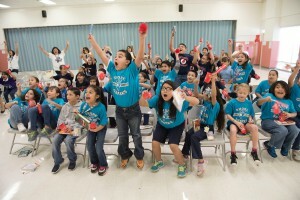 The NCAA Read to the Final Four Literacy competition, which supported the HISD Literacy By 3 initiative, challenged HISD third-graders to read more books than other competing schools and started with 68 schools. Nearly 6,800 third-graders helped kick off the bracket-themed reading contest that encouraged students to read at least 30 minutes a day. This entry was posted in District II - Rhonda Skillern Jones, District IX - Wanda Adams, News and tagged Browning ES, Carrillo ES, Dogan ES, Janowski ES on April 1, 2016 by HISD Communications. Of the eight schools that advanced to the Elite Eight, only the Final Four remained standing on Feb. 5, during the Read to the Final Four Literacy Competition pep rally at the University of Houston’s (UH) Hofheinz Pavilion. The Read to the Final Four Literacy Competition began in the fall of 2015, with 6,800 third-graders participating. Since that time, they have logged 6.4 million minutes of reading and, according to the Houston Public Library, checked out more than 5,000 books from its shelves. Approximately 800 students attended the pep rally, which aimed not just to inspire the students, but to reward them as well for all of their hard work. The top reader from each of the 68 participating schools will receive a bicycle, courtesy of CYCLE (Changing Young Children’s Lives through Education). The winning school will also receive a monetary award. The remaining four schools will continue competing until the final event in April, when the top school will be announced. Students at the other 64 schools should not stop reading, though, as there may be additional prizes for the top individual readers. This entry was posted in District IV - Jolanda Jones, District IX - Wanda Adams, Literacy, News and tagged Browning ES, Carrillo ES, Dogan ES, Janowski ES, literacy, Read to the Final Four on February 5, 2016 by HISD Communications. This entry was posted in Achievement/Recognition, District I - Elizabeth Santos, District II - Rhonda Skillern Jones, District III - Sergio Lira and tagged Black MS, DeZavala ES, Dogan ES, Hogg Ms, Reagan HS, Waltrip HS on May 8, 2015 by HISD Communications. Shearn Elementary School is one of 14 HISD schools launching the school year today as a dual-language campus, with instruction in both English and Spanish, and students had a special visitor this morning. Dr. Terry Grier dropped in as the school day began to greet students and parents, and to pump up their enthusiasm for dual-language. “I sure wish we had this when I was in school,” Grier told a trio of fifth-grade school leaders who guided him on a tour of Shearn. This entry was posted in Elementary Schools, Middle Schools and tagged Anderson ES, Ashford ES, Billy Reagan K-8, Briscoe ES, Burbank MS, Burnet ES, Coop ES, Daily ES, DeAnda ES, Dogan ES, Emerson ES, Garden Villas ES, Gregg ES, Helms ES, Herod ES, Herrera ES, Johnston MS, Kashmere Gardens ES, Law ES, Mandarin Chinese Language Immersion Magnet School, McNamara ES, Memorial ES, Northline ES, Osborne ES, R P Harris ES, Reagan HS, Shearn ES, Sherman ES, twain es, Wharton DLA, Whidby ES, White ES on August 25, 2014 by HISD Communications. This is the sixth in a series of stories counting down to the start of school, spotlighting what is new in HISD in the coming year. When the school bells sound Monday in HISD, 14 additional elementary campuses will be conducting classes in two languages, as the district expands its successful dual-language program to a total of 32 schools. The structure offers foreign language immersion for English-speaking students and a bilingual program for Spanish speakers. This entry was posted in High Schools, Middle Schools, News and tagged Anderson ES, Ashford ES, Briscoe ES, Burbank MS, Burnet ES, Coop ES, Daily ES, DeAnda ES, Dogan ES, dual language, Emerson ES, Garden Villas ES, Gregg ES, Helms ES, Herod ES, Herrera ES, Johnston MS, Kashmere Gardens ES, Law ES, McNamara ES, Memorial ES, Northline ES, Osborne ES, R P Harris ES, Reagan HS, Reagan K-8, Shearn ES, Sherman ES, twain es, Wharton Dual Language, Whidby ES, White ES on August 19, 2014 by HISD Communications.